If you are a business utilizing cranes in the state of Nevada the need for an Isom Certification Program has never been greater. 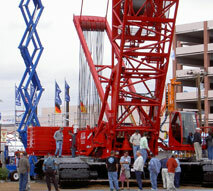 On May 27, 2005 the Nevada State Assembly passed a bill requiring all crane operators to be certified. You may read Nevada Assembly Bill No. 540 - Committee on Commerce and Labor NRS 618.880 (PDF - 25 KB) for complete information on these new requirements. Nevada is one of just many states that are moving toward mandatory certification. Many experts believe that this will soon be a nationwide requirement. Isom Cranes is nationally certified to offer comprehensive crane certification programs that include training for both written and practical (hands-on) examinations. These certification programs cover mobile, tower and overhead cranes for state licensing. Certification programs can be held at the Isom Crane's Reno, Nevada facility or on-site at your location. For certification to occur on-site, the site must be converted to a certified training facility. As an approved test site coordinator and test site host, Isom Crane has the knowledge and the experience to establish an approved test site at your location. Isom not only trains your crane operators but can arrange for all testing, both written and practical at your site. We've bundled the complete training and testing certification process into one inclusive package that makes it easier than ever to license crane operators properly. Isom Cranes can facilitate both the written and practical tests at the same time, at our facility or yours. Please, contact Isom Cranes today to discuss which certification program best fits your needs and to arrange the certification.